Good plan design can do a lot of the heavy lifting for you to help your employees save enough for retirement. Historically, sponsors and advisors have spent a lot of time and energy trying to convince employees to enroll, pick sensible investments, and defer enough for a secure future. Truth be told, we use our time a lot better when we build best-practice design features into the plan to take care of these basic issues for participants. This frees everyone to focus more on the meaty stuff: financial wellness education that helps employees deal with the things that get in the way of saving, like the challenge of setting a monthly budget and managing debt. Defaulting into a QDIA: These days, I rarely run into an employer who rejects the idea of defaulting employees into a QDIA (qualified default investment alternative). But some employers haven’t gotten around to doing it just yet. I’m having a dialogue with a profit-sharing plan sponsor client about why it makes sense to move forward with defaulting employees into a QDIA. These default investments immediately get participants into a professionally-managed asset allocation, which for most participants works better than picking their own allocation. And as long as you follow the QDIA guidelines, you can utilize a default investment with minimum fiduciary risk to yourself as a sponsor. At this point, I feel that it’s almost more of a risk not to default participants into a QDIA than to do it. But, what about the current volatile market? A key to surviving and thriving in this market madness is sticking to your investment strategy, and a QDIA may make that decision earlier on employers and employees alike. It’s also important to have a process to evaluate the QDIA in place, which includes looking at the demographics of the plan. Automatic enrollment: Some employers who haven’t yet implemented auto-enrollment have an “if you build it, they will come” philosophy about offering a retirement plan: they take a hands-off approach and see their role as providing a basic plan. If employees aren’t smart enough to use it, these employers think, that’s their issue. But in reality, time constraints–not lack of smarts–often keep new employees from enrolling. Auto-enrollment is such a wonderful response to how busy people feel when they start a new job with so many demands on their time. When I talk to hesitant employers, I emphasize how much new employees actually appreciate the convenience of getting auto-enrolled. It gives new hires a great start in the plan, and if they later want to fine-tune their strategy for deferrals or investments, we can help them with it. Auto-escalation: Many of the sponsors we work with have upped their auto-enroll default deferral rate from 3% to 6%, and some of those employers feel nervous about also adding an auto-escalation feature. They think that it will upset employees and may worry (unnecessarily) that auto-escalation will be an administrative hassle with their provider. If employers feel nervous about auto-escalation, I talk with them about the realities of saving for retirement. If you look at research on what it takes to get ready, people need to save around 15% of their pay every year. Even if you auto-enroll at 6% and match another 3%, for example, that still leaves your employees falling short. The good news is that auto-escalation can get them to 15% incrementally. Safe harbor plan design: Some employers hesitate to adopt this design because they feel they can’t afford it, and the idea of immediate participant vesting especially sticks in their craw. We can work with employers who want a safe harbor design but not immediate vesting. We have a medical shared-services client who felt that way, so in January of 2018 we helped the plan shift to a safe harbor design that features auto-enrollment and a QACA (qualified automatic contribution arrangement) with a two-year vesting schedule. The new design clears up the plan’s testing issues, which allows the employer, and us, to shift our focus to making more improvements. These include adding an employee financial wellness program and moving away from the use of revenue sharing to revenue-free share classes. Enhanced match formula: Many sponsors understand that they have the power to impact savings rates but some struggle to understand that an ineffective matching formula may be sending the wrong message and even encouraging employees to contribute less. Consider this: most participants take their deferral cue from the employer’s match; so, if you were to offer a 100% match on the first 2% of pay deferred, many employees would only defer 2%, and that is far from a meaningful savings rate. We can conduct an analysis of different match-formula scenarios and project what they would cost. With the strong economy and recent corporate and personal tax cuts, it’s a good time to think about enhancing your match. There could be an opportunity to use part of your company’s tax savings to increase your match spending such that employees, who got a paycheck bump from the tax changes, may feel less of an impact by the deferral increase. We believe that a properly designed plan built with your company’s goals in place is a very powerful tool. 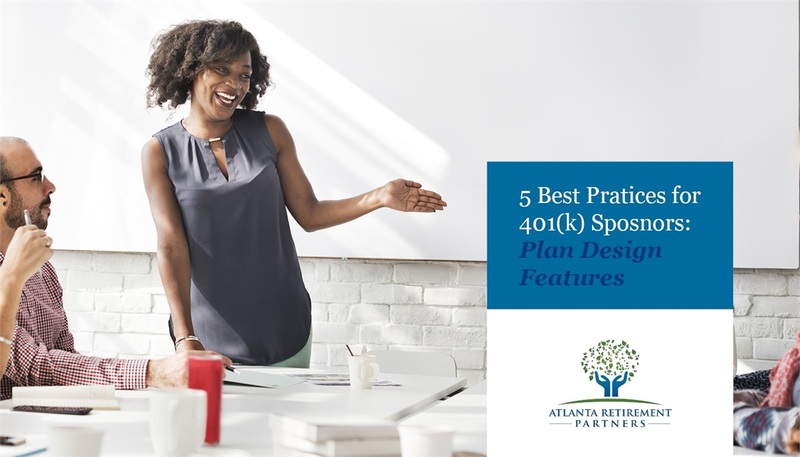 In fact, we feel so strongly about the plan design features discussed in this article that we consider a new plan's willingness to utilize or implement them as a factor before bringing them on as a client. If you have questions about these, or any other enhancing plan design features, contact us today!